We love the aesthetic beauty of our range of greenhouses; our Fully Glazed, hexagonal and classically designed ranges. They are all simply stunning but we know that gardeners have a lot of tools that need housing alongside the plants that you are growing. We know that gardens vary in shape and size and that not everyone can have our largest Greenhouse in their garden or do they have space for a Shed and a Greenhouse – so we have combined the beauty of the Greenhouse and the practicality of the Shed in our ‘Potting Shed’ range. Made from pressure treated, slow grown timber which is designed to withstand the ‘British summer’ this elegant Garden Building offers both functions of these buildings in a space as large or compact as you choose thanks to our varied range. 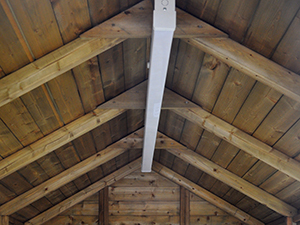 The heavy duty roof beams provide additional support to the toughened glass roof. Both the beams and the 16mm thick roof boards ensure that this is a very strong roof structure and prevents unsightly sagging. The 4mm toughened glass is much better than the Perspex or Styrene that is common on the market as it is more resistant to scratches and clouding up over time. By using 4mm toughened glass, instead of the 3mm that is industry standard, you can rest safe in the knowledge that a stray football or stone should not break the glass. A video available on our YouTube channel shows just how strong our toughened glass is. In the video our Director Andy hits the window with a brick which simply bounces off of it, a stark contrast to the two other glass panels that are tested which smash instantly. It is not until Andy throws the brick at it harder a second time that it breaks. Better still, when the window is damaged it does not break into shards but rather crumbles making cleaning up easier and safer. We use full panes of glass instead of the half panes that are joined together in the middle with clips like some of our competitors. By using full sheets of glass we not only add to the strength of the greenhouse but we also improve the resistance to the poor weather conditions that the ‘British summer’ can bring. These are held in place with individual wooden beads which hold our glass in place. This means that, if the glass breaks, you don’t have to remove the entire roof to remove it but can remove each pane individually thus saving you time and money on repairs. This suntrap is gorgeous and can be bought with our fully pressure treated staging in either fixed or freestanding forms. If you choose the fixed you can choose between single or double dependent on what space you need. 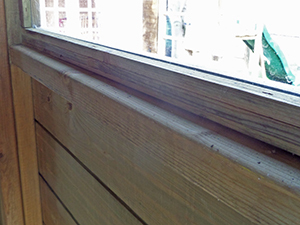 By pressure treating the timber we can offer protection against rot and insect infestation – invaluable in an environment such as this. The fixed staging, both single and double, runs parallel along the depth of the Greenhouse. They have been designed to utilize the space to maximum effect, even the framework supporting the staging is angled to ensure that you have full movement when working and can store a lot of tools underneath such as pots, compost bags, buckets and seeds etc. The staging itself has a width of 500mm and provides plenty of space to host plants, pots and grow bags. Why not ensure that your garden is growing to its full potential this spring by purchasing one of these frankly stunning Potting Sheds. Act quick as our sale must end on the 3rd January 2015.